Minnesota Conservatives: The Death Rites Of The Biking "Community"
The biking "community" has long been insufferable in both their pretentiousness as well as their completely unearned but self-awarded moral superiority. These zealots demand to be taken seriously in their attempts to subvert automobile travel. Their self-absorption is breathtaking but bikers appear to have little, if any, self-awareness. Bikers come replete with standard issue positions of the lazy left on almost any political or social topic. Indeed, these types are the quintessential "the personal is the political" adherents which, if taken literally, means we should have a civil society minutely politicized. This, of course, is a hallmark of communist, totalitarian thinking. The arrested development of the permanent adolescent has no greater expositor than the biking types; beta-males incarnate. The death of a newly arrived man in Minneapolis brought this creepy aspect of bikers to my attention. Marcus Nalls, late of Atlanta and only 26 years old, was killed recently when a van crashed into a parked car and then continued, striking then pinning Nalls under it where he died immediately. This sad accident was seized upon by the two wheelers in order to politicize his death. And if you don't think bikes and other fetishized modes of transportation aren't politics, you've not been paying close enough attention to the members of the anti-car movement. Nalls' death is sufficiently sad unto itself, it seems to me, to require nothing more than remembering him as the person he was and wanted to become. Isn't that what will happen when we all die? His young age is especially sad, which is why we feel a greater loss for a twenty-something than an eighty-something. Instead, an inconsequential aspect of him is rendered into the very substance of the man. This is what cults do. Of course tediously earnest bikers would insist that Nalls' biking "was his essence" or some such fatuous locution. Nonsense. Only an unthinking collectivist approach could turn a personal tragedy into small potato political agenda advancing. Bikers manifestly think of, and act like, they are morally superior in almost every regard to you schlubs who do not bike. Revealingly, the individual is immediately lost into the collective and it is from this group approach that comes a sophisticated form of bullying, the lobbying and browbeating for road changes that makes driving a car that much more difficult. Roads are for cars, with bikes far secondary. The spandex crowd wants to reverse that order. At any rate, I was fascinated by the "memorial" held by the shallow Minneapolis biking community: it was all about them, which is to say, all about bikes. How small the life inherent in the progressive vision. WCCO-TV had a fascinating online report about the "memorial" which focused on Nalls' means of transport much more than the actual human being. "More than 200 riders made their way from Loring Park to the sidewalk along Franklin [where Nalls died]. There, in a solemn procession, they walked their bikes past the “ghost bike,” which is a memorial bicycle that’s painted white." Naturally, what is really going on is the narcissism of the biking community being put on prominent display for the public to see but mostly for themselves. 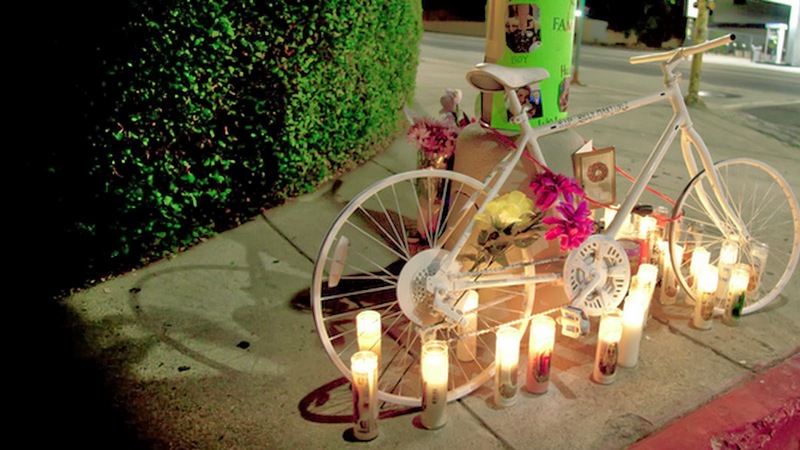 One white bike after another: no individual, just the hope that bikers still living won't die in a similar fashion. White bikes are the crucifixes for the secular, "spiritual but not religious" types in our midst. The dislocation of religion into environmentalism and Portlandia lifestyles is relentless. The WCCO report went on to state: "Some of them passed sobbing, while others stopped briefly to place flowers." Sobbing for a person you never met, never knew? Are dead bikers the new Princess Diana for this crowd? Because, given what life is, Nalls won't be the last biker killed and then grotesquely fetishized in death. You can read the WCCO story here. My favorite part of the story, though, was this: "Ride organizer Ginny Herman says the people who came out to celebrate Nalls’ life have 'kind hearts.'" Super duper kind hearts, Ginny, unlike those drivers of automobiles. You biker squishes are the best and you'll never fail to tell yourselves that first, then others. Go have a cup of chamomile tea with an organic bran muffin and journal the depths of your soul. Simplistic, sentimental, and narrow-minded, the biking community is a symptom of the larger disease the infects society, which is to say progressivism but with which only a distinct minority of 20% of Americans identify. We owe it to ourselves and our children to resist them. Marcus Nalls was a sous-chef at the Minneapolis Hyatt; he moved here from Atlanta for that specific job. Rather than some unctuous public demonstration of self-regard, those who might want to honor his memory should think of putting together a scholarship at a local culinary institute in his name. That, of course, would require the "kind heart[ed]" biking "community" to step outside itself and see Nalls as a human being and not a cause.